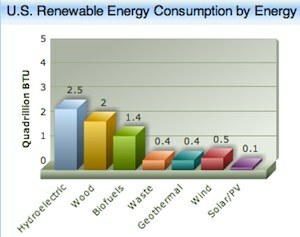 Comparing different sustainable energy sources, biomass and biofuels are clearly poised to come out on top. Hydroelectric is limited due to geography and climate -- as well as environmental concerns. Further investment into big wind installations is simply pouring resources down a sewer. Solar has potential, but it is limited by insolation to specific regions -- and badly needs cheap energy storage. Visual aids help to get a better grasp of the different strengths, weaknesses, and potentials of different energy sources. Fuel alcohols production and biodiesel production are both growing exponentially. And while investment in new wind power is significant, the actual power output from all the investment in wind is not significant. Biomass can be grown virtually anywhere on land and sea. Take the new method of seaweed cultivation, developed in Norway. In Norway, Seaweed Energy Solutions has patented the first ever modern structure to enable mass seaweed cultivation on an industrial scale in the world¹s oceans. The structure, known as the Seaweed Carrier, makes a clean break with past seaweed cultivation methods that have all been based on ropes. The Seaweed Carrier is a sheet-like structure that basically copies a very large seaweed plant, moving freely back and forth through the sea from a single mooring on the ocean floor. And one does not necessarily think of Poland as a bioenergy giant, yet giant French utility GDF Suez has chosen Poland as the site for a new 190 MW bioenergy plant. Algae can grow in the desert, thriving on wastewater and brackish water. Various species of biomass and biofuels crops are adapted to cold, moderate, and very warm climates -- but using genetic tools, they can learn to thrive in virtually any climate. Microbial fuels -- custom made to generate virtually any chemical or fuel -- are being adapted to mass production at any scale. Microbial Energy: Waiting for Q?